I’ve been keen on smartwatches pretty much since day one. I get a lot of emails, texts, and assorted notifications, most of them garbage but some vitally important. Having a glancable screen on my wrist makes life infinitely easier. But smartwatches have come a long way since they showed up a few years ago. Which watches are best at keeping me from pulling out my phone? I decided to find out. Telling the goddamn time, all of the time. Sending me simple on-the-wrist notifications that let me know why my phone just buzzed. Who emailed, who texted, what the first few words of their message are, etc. This discovery led me to rule out a few types of wearables—straight-up fitness trackers, for instance—as well as “smart” analog watches that can vibrate but not show me the subject line of an email. Most importantly, it led me to rule out any watch that can’t go at least 24 hours with its screen on the whole time. A watch that does not show you the time when you look at it is not a good enough watch and there’s nothing more maddening than looking at your wrist and not seeing the time. Gesture-wake is never perfect, so always-on is mandatory. And of course, a dead watch tells no time. After I sorted the wheat from the chaff, these were the watches worth wearing. The Pebble Steel long held the position of best smartwatch, so it would make sense that its natural successor would take its place. For $200 (one of the cheaper smartwatches on this list) you get a more refined designed, color e-paper display with a week-long battery life, and waterproofing all wrapped in a metal casing. That’s $200 well spent. But what really makes the Time Steel such a joy over its competitors is its measured approach to being a smartwatch. Where the Apple Watch and several Android Wear watches try to be the I-can-do-everything machine attached to your wrist, the Time Steel delivers a simple interface for keeping on top of notifications and a few other tricks. It provides convenience without being cumbersome, and as we said in our review back in August 2015, that’s all a smartwatch should do. If all you care about is style, the $350+ Apple Watch is the one I like best. You can get its precision machined metal body in aluminum, steel, or even 18-karat gold if you’re feeling particularly spendy. The attention to detail is incredible, and the interchangeable straps are a real treat—even the basic $50 Sport band has a luxurious feeling, and others feel pretty decadent for a miniature wrist computer that will likely soon be obsolete. The Apple Watch also has the potential to be the most functional smartwatch someday, thanks to the App Store, but it’s not even close right now. It feels pretty half-baked. Even now, it can do more things than a Pebble or Android Wear—but it doesn’t do some of them particularly well. You also need an iPhone 5 or newer to use the Apple Watch at all. If you really need to triage your Gmail inbox, I’d recommend looking at Pebble or an Android wearable. Read our full Apple Watch review. 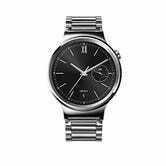 The Huawei Watch gets lots of things right where many Android Wear watches have struggled in the past. First, it looks good—it even has a full 360-degree display (without the flat tire design found on the Moto 360). Second, it comes in a wide range of colors, styles, and prices, so you can pick a watch that fits you best. And finally, it comes with a built-in speaker so it can take advantage of Android Wear’s latest features. That’s not to say this is the perfect Android Wear device. Battery life isn’t stellar, the watch casing is bulky, and the Huawei Watch is somewhat pricey if you want something more than just a standard leather band. But this is the best Android Wear has to offer, and it’s damn good-looking offer. Read our full Huawei Watch review. At first glance it appears incredibly tiresome (and in some ways it is), but it makes cycling through your different notification stupid easy. Not to mention it gives a satisfying click as it cycles through each menu. 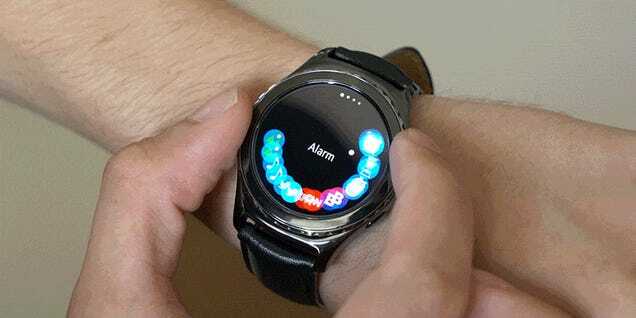 The reason the Gear S2 isn’t flat out the best smartwatch out there is that it runs on Samsung’s Tizen platform, which means it tries to be the be-all-end-all smartwatch like the Apple Watch or Android Wear watches, but with significantly fewer apps and dev support. We’re not entirely sold on the S2's software support longevity. But that doesn’t stop the Gear S2 from being one of our favorite gadgets from 2015, and arguably the first Samsung smartwatch that’s been worth $300. If you’re looking for something fun and different, this is the watch you want. If you want to just dabble in smartwatchery without dropping a lot of cash, get the original $90 Pebble. Functionally, it’s the same as the Pebble Steel but in a cheaper, more robust (and uglier) plastic body. I hated the Pebble’s look at first, but eventually I came around to kind of dig it. Also the plastic body and rubber strap make it great for wearing at night (sleep-tracking) or in the shower (music control/just being way too connected). Even though the screen on mine got a little scuffed, I learned to love the little sucker for being so robust and trusty. There’s no better way to explore whether you actually want a smartwatch (short of borrowing one somehow) than buying the Pebble. If I didn’t have so many new smartwatches landing on my desk, this is probably the one I would get. The Pebble Time isn’t cheap or feature-filled enough to supplant it... yet. This thing was our kind of smartwatches for sometime, thanks to its long-lasting battery, simple approach to the smartwatch, all packaged in a great design. But then the Pebble Time Steel showed up and blew us away. Out with the old, in with the new. Read the review. It’s a gorgeous watch and it runs Android Wear really well. It’s also $1500. This one’s only a must if you’re a watch collector and interested in the traditional watch you can buy when your Connected is defunct. Read the review. It’s like the Moto 360, but waterproof, and loaded with fitness goodies. Also it has a wicked ugly wrist band that you can’t even trade out. Read the review. It claims to be the smart watch you can navigate the world with, but many of its claims didn’t pan out. It’s still an incredibly accurate and durable smart watch. It’s also incredibly huge. Read the review. The Pebble Time is pretty good. It’s fun! But it’s not that much better than the Pebble Steel , and the too-dim screen could be a dealbreaker. The Pebble Time Steel, however, could be the best of both worlds. We’ll let you know as soon as we get one. One of the best-looking Android Wear devices out there, the $300 LG G Watch R is pretty great. It looks nice and sporty, and the battery’s beefy enough to always last the day. It just doesn’t look particularly stylish compared to the Apple Watch, which only costs $50 more. Our other former top pick for a stylish Android Wear device, the $200 Asus ZenWatch still looks great, but nowhere near as well constructed as the Apple Watch—which makes it look huge by comparison. For a new low price of $130, it’s not a bad deal! Debuting with whimsical animations and an all-new color display for Pebble, the Time was the most fun we’d had with a smartwatch in awhile. But then the Gear S2 came out, and things changed, and while the Time is still great, the Time Steel is greater. We’ve spent nearly two months with the $350 LG G Watch Urbane, and it’s not bad for Android Wear. But it’s bulky, pricy, and even the cheapest version of the Apple Watch makes it look like a toy. The button and plastic rear cover feel a little cheap, and the thick bezel makes it tough to swipe. The Moto 360 is beautiful, simple, and elegant, but it’s not good enough. You still have to shake the watch to turn on the screen, and battery life doesn’t always last the day anyhow. A new lower $150 price does help, though! The best-performing Android Wear watch is pretty homely. The transflective LCD screen is easy to see in bright light, but the G Watch R and Zenwatch work nearly as well and look way better. Decent hardware, garbage software. Thin strip-like screen that functions like a tall, vertical display is bad at notifications. All that plus it’s only compatible with Samsung devices. Pass. More fitness tracker than smartwatch, the interface and notifications leave a lot to be desired as far as smartwatches are concerned. Way too many limitations. No Android 5.0 support, no way to do anything except see your notifications. Plus we had a really hard time keeping it paired with our phone. Good as a fitness tracker but not as a smartwatch. No way. You get call notifications, SMS notifications, and that’s it. They take up the entire screen. No way to see your email. It’s not the best fitness tracker for the money, and not a great smartwatch either. Not a smartwatch. This cheap fitness tracker does smartwatch notifications, but they’re woefully unspecific: you get three blinking green lights and a quick vibration on your wrist no matter what your phone is trying to tell you. And it doesn’t tell the time. Fine, but both the Pebble Steel and the ASUS Zenwatch are better, prettier, and cheaper. Like the G Watch, it’s boring but not bad, though the Steel and Zenwatch have it beat in looks and price. Also the Gear Live’s default strap is garbage, so you have to buy a replacement if you dont want it to pop off and break. Big, clunky, expensive. It has its own data connection, but that’s of dubious value and doesn’t excuse the rest of its flaws. Old, bulky, unchangeable bands, Samsung phones only. Nope. Mirasol screen is cool, but this sucker is bulky, ugly, and hard to come by. And this upcoming LG smartwatch has an immense battery and all sorts of new features. Looking forward to giving it a go, but seems like it won’t be sold outside Korea. An Android Wear device with a digital crown like the Apple Watch? Definitely want to give this a go, particularly since the original was one of the most stylish watches we’ve used. More of a fitness tracker than an smartwatch, with no smartphone notifications. Don’t confuse it with the ZenWatch or ZenWatch 2. Clever analog/digital design but the tiny little horizontal window is just bad at telling you what you want to know. Reviews are mixed, and ultimately you’re just buying a more expensive Pebble Steel with a weaker app library. 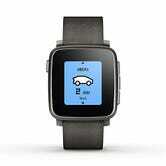 Same deal as the M1 and Frame, except with regards to the cheaper Pebble instead. Old, use proprietary Sony software, and are both just bad. These watches only work with Samsung phones, so they would have to be truly amazing to be worth locking yourself down. They are not. At this point, we’re convinced that the original Razer Nabu (the one with the screens) doesn’t actually exist for public consumption. You can’t buy one, and Razer won’t send us one either. Runs straight up Android 4.2.2, which is noooooot designed for a watch screen. Widely known to be a complete disaster. Extremely mixed reviews, not worth dabbling with no-name software. No screen, no smartwatch. Also expeeeensive at ~$500. Announced at CES 2014 but never showed up. I’d try a $50 smartwatch if it existed, though. Intriguing but expensive and more watch than smartwatch. Expensive at $350, and there are no reviews. The company wouldn’t send me one. Expensive, unproven software and ecosystem. Sparse and bad reviews. Also these guys are promoting a ridiculously impossible smart ring right now so I don’t trust them at all. More calculator watch than smartwatch. All crowd-funded, none of them have shown up yet. Never buy a product until it actually exists. 2/2015 - Updated The Rest with Basis Peak, Fitbit Surge, Pebble Time, Sony Smartwatch 3. 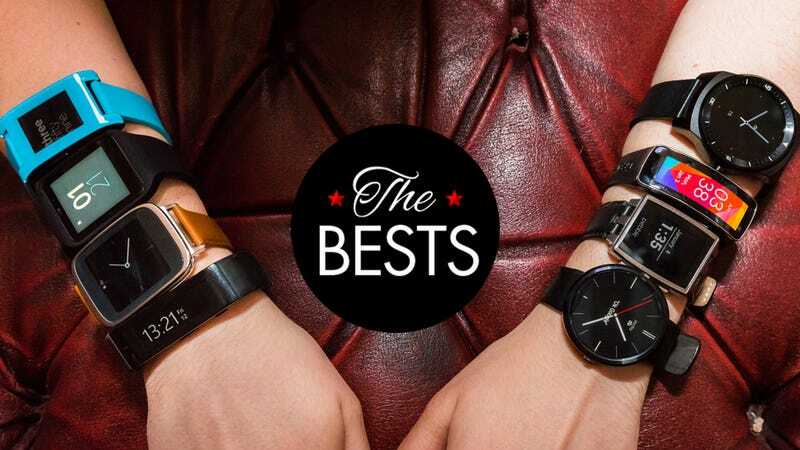 5/2015 - Apple Watch named The Most Stylish, demoting LG G Watch R and Asus Zenwatch to The Rest. 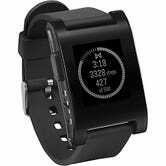 Updated The Best with lower price for Pebble Steel. 7/2015 - Pebble Time named The Most Fun. Added LG G Watch Urbane and Razer Nabu X to The Rest. Updated price on Moto 360 (from $250 to $150) and Asus ZenWatch (from $200 to $130).